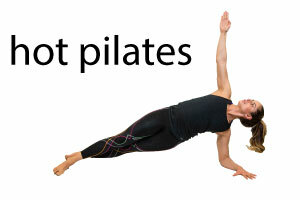 Hot Pilates is an extremely chal­leng­ing full-body work­out using Pilates prin­ci­ples. There is no impact, so it is safe prac­tice for all fit­ness lev­els of students. And it makes you feel goooooood. How would you like to strengthen your core mus­cles so that you can eas­ily lift up your up kids or carry your gro­ceries? How about keep­ing your body feel­ing young, healthy, and strong? Would you like that? Hot Pilates is a train­ing sys­tem which com­bines Pilates prin­ci­ples with high inten­sity inter­val train­ing and is per­formed in a room heated to 95 degrees Fahren­heit and 40% humidity. Why would you do Hot Pilates? Hot Pilates cre­ates long lean mus­cle mass, burns fat, and increases fit­ness lev­els. It cre­ates a stronger core, improves cir­cu­la­tion, and increases flex­i­bil­ity. It is per­formed on a yoga mat mak­ing it zero impact, pro­tect­ing your joints and mus­cles from the pound­ing of other exer­cises like run­ning and jumping. Hot Pilates com­bines car­dio and mus­cle ton­ing in a heated room. The high inten­sity inter­val train­ing keeps your heart rate up, help­ing you burn fat. The Pilates prin­ci­ples sculpt you body, cre­at­ing long lean mus­cle mass. The heat loosens up the mus­cles quickly, and the humid­ity makes you sweat — ele­vat­ing your heart rate, boost­ing metab­o­lism, and pro­mot­ing detoxification. All you have to bring is 1) a yoga mat, 2) a towel, and 3) a large water. We offer intro­duc­tory rate for new stu­dents who want to try it out and monthly mem­ber­ships who wish to make Hot Pilates their reg­u­lar practice.